Since the advent of the commercial Internet, I have collected tens of thousands of data points that have given me the ability to identify what I call the 8 Money Draining Mistakes. These are the things — the simple mistakes — that can cause of business to leak serious money every single day. Cash being sucked right out of the company. I devoted last week’s solocast…episode 127…to taking you on a deep dive into the 8 Money Draining Mistakes. But say you studied last week’s solocast — and have taken corrective action and you have plugged all of the holes in the bottom of the boat. All of the leaks — the money draining mistakes have been solved. Awesome! The next step is to master and apply what I call the 8 Money Making Opportunities. These 8 opportunities are like a big outboard motor that you put onto the backend of the boat you just fixed — and then you can zoom across the lake. These 8 opportunities are where ROI in your online marketing gets turbocharged. So in today’s solocast, I am going to take you on a deep dive into the 8 Money Making Opportunities. But why take you on that journey? On the Predictive ROI side of our business, I see it all the time: many business leaders feel overwhelmed by digital marketing or the strategies being applied by the people within their company. Business owners have told me that they often worry they’re not keeping up with the latest advances but fear looking foolish if they ask for help. After 20-years of academic research and private sector experience at Predictive ROI, we’ve developed proven and reliable ways to increase website traffic, leads, and sales. I am going to share the best of what we have with you right now. And if you go to predictiveroi.com/3download you can get access to a private VIP video training series that I created — it walks alongside of this solocast and provides and even deeper step-by-step process to follow. Each video is 100 percent free training — I am standing at the whiteboard — sketching out the recipes so you can put that into practice in your business straightaway. So let’s dig into 8 Money Making Opportunities. Money Making Opportunity #1: HARMONIZE OFFER WITH NEED. The first money maker is adapted from what SUCCESS Magazine publisher Darren Hardy calls “the white knight strategy”. Essentially, you take your X-Y-Z statement (for more on the X-Y-Z exercise, see Money Draining Mistake #2 in last week’s solocast) and then blend it with what you know about your client avatar (again, see Money Draining Mistake #5 for more on the client avatar strategy), and create a statement that shows prospects you have the solution to all their pain points. That makes an empathetic connection with your clients and prospects. Serve up your offer in a way that will inspire an emotional response from your client. For example, many of our clients have been burned by so-called experts, so we include a money back guarantee in our statement. This gives people a sense of relief at the low risk involved in their decision to engage our team. Use your new white knight statement in presentations, articles, proposals, books, training videos, or wherever you make an introduction to your company’s value. Money Making Opportunity #2: BUILD YOUR LIST. The most valuable asset of any business is the client list. To build your list you’ve got to develop a screaming cool offer, such as a free pdf, video series, or exclusive audio insights podcast. The value you create must be massive. Share your expertise and keep it focused in the area of your XYZ statement. Then, feature this offer throughout your site for maximum distribution. One of the best tools for maximizing distribution is WP Popup Magic. It’s very simple to use. If your value exchange is truly valuable enough, 6 to 13 percent of the visitors to your site will give you their email address just to access what you’re offering. Money Making Opportunity #3: NURTURE RELATIONSHIPS AND INCREASE SALES. Email marketing is the most effective way to build trust relationships with prospects. By giving, giving, giving to your list through content distribution, you create well-prepared prospects. Then when you offer something really awesome, like a discounted training program for a very limited time, you get immediate and intense conversions for huge revenue. Make your list members feel like they’re in on an exclusive conversation, like they’re sitting around a campfire among only a select few. 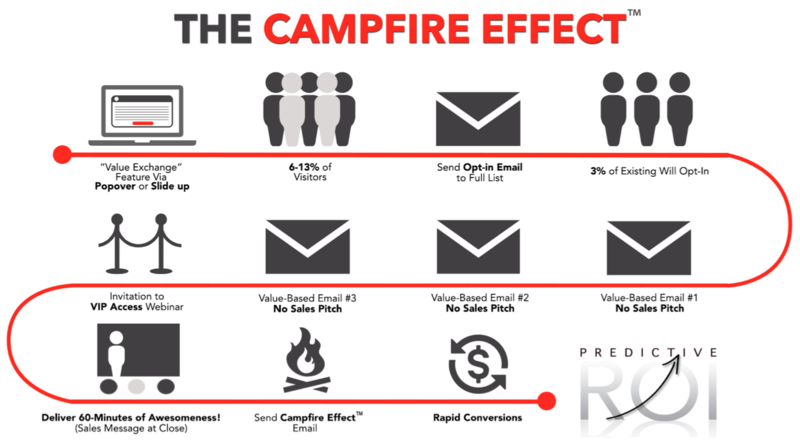 When you send these Campfire Effect Emails™, you’ll be amazed at the response. Be sure to base your content on your client avatar’s pain points and your white knight statement. Money Making Opportunity #4: NO-FRICTION LEAD GENERATION. The form that visitors use to enter their email addresses needs to be in an environment that encourages trust. What is your form next to on your homepage? Ads? Your blog roll? Put that lead generating form next to a value exchange, such as an offer for a free download or video. You can even put your credentials adjacent to the form to help instill a sense of security in your qualifications as prospects hand over their contact information. Dr. Flint McGlaughlin, my guest for episode 41 of Onward Nation, taught me a very valuable lesson about friction and lead generation. Flint is the director of MECLABS and Marketing Experiments — the leading researchers in online marketing for the past 15 years. During our interview…he explained that in your optin forms — every field you include beyond just email — will reduce your conversion rate by 50 percent. Every field, Onward Nation. Money Making Opportunity #5: CREATE ANTICIPATION. You need to continuously seed and open loops to your sales message within your email funnel, blog posts, webinars, and presentations. Within value based emails, be sure you’re not trying to sell anything. Just offer a tip—for example, one of 47 tips you have for increasing the value of your home. Deliver awesomeness one small piece at a time while mentioning that there are 47 tips total. That opens a loop in their minds, and they’ll be more inclined to read your email next time to learn the next tip. You can also tease your upcoming events, planting a seed that you’ll expand on in a later email dedicated to promoting the event. Money Making Opportunity #6: SOCIAL MEDIA DONE RIGHT. When visitors come to your website from Facebook, Twitter, or other social network, your conversion rate increases dramatically. But why 780%? Because your connections — your social media followers — are further along in the know, like, and trust funnel than someone who finds you through a Google search. We’ve found that if you post twice a day, morning and afternoon, you’ll get and retain the most followers. Use our six to one ratio for posts: six professional or life posts for every one product or sales post. So create six posts related to events you’ve attended, awards you’ve received, blogs you’ve written, or vacations you’ve taken with your family. Let people get to know you. Then write one post that invites followers to buy now, download an offer, or attend a webinar. Our studies show that this strategy will increase site traffic by 23 percent. Money Making Opportunity #7: MULTIPLY CONVERSION RATE BY 200 TO 800%. We strongly encourage our clients to use Adroll.com, the leaders in ad retargeting, or re-marketing as it’s oftentimes called. Retargeting your site visitors means that after someone has visited your site but not converted, they’ll see your ads as they click around to other sites. These retargeted ads increase your conversion rates by 600 to 800 percent because they build on the familiarity prospects already have with your website. But here is the most often made mistake when marketers create a retargeting campaign. Don’t use retargeting to sell. Instead, use retargeting to give! Promote the screaming cool value exchange that leads to an optin. You will experience a much higher conversion rate and your list will grow so you can develop a relationship over time. Money Making Opportunity #8: AND FINALLY…CONDUCT A/B TESTING TO FURTHER INCREASE CONVERSION RATE. Before you make any major change to your site code, conduct A/B testing to see which changes produce positive results in your conversion rate. Online programs like? Visual Website Optimizer help you create a test in a few minutes. We have increased conversion rate by 200 percent through one A/B test. Remember to make one improvement at a time and see how your results change. By incorporating the 8 Money Making Opportunities, you’ll increase leads, conversions, and revenue. A consistent, test-as-you-go method will allow you to see the power of various strategies and start seeing results right away. None of these strategies require specific expertise—you can do this. I will be back tomorrow with my interview with Monica Wofford — another one of today’s top business owners.